In this computer-generated image, a red oval marks the disk of our Milky Way galaxy and a red dot shows the location of the Sagittarius dwarf galaxy. The yellow circles represent stars that have been ripped from the Sagittarius dwarf and flung far across space. New research reveals that five of the 11 farthest known stars in our galaxy were ripped from another galaxy – the Sagittarius dwarf. The 11 farthest known stars in our galaxy are located about 300,000 light-years from Earth, well outside the Milky Way’s spiral disk. New research by Harvard astronomers shows that half of those stars might have been ripped from another galaxy: the Sagittarius dwarf. Moreover, they are members of a lengthy stream of stars extending one million light-years across space, or 10 times the width of our galaxy. “The star streams that have been mapped so far are like creeks compared to the giant river of stars we predict will be observed eventually,” says lead author Marion Dierickx of the Harvard-Smithsonian Center for Astrophysics (CfA). The Sagittarius dwarf is one of dozens of mini-galaxies that surround the Milky Way. Over the age of the universe it made several loops around our galaxy. On each passage, the Milky Way’s gravitational tides tugged on the smaller galaxy, pulling it apart like taffy. 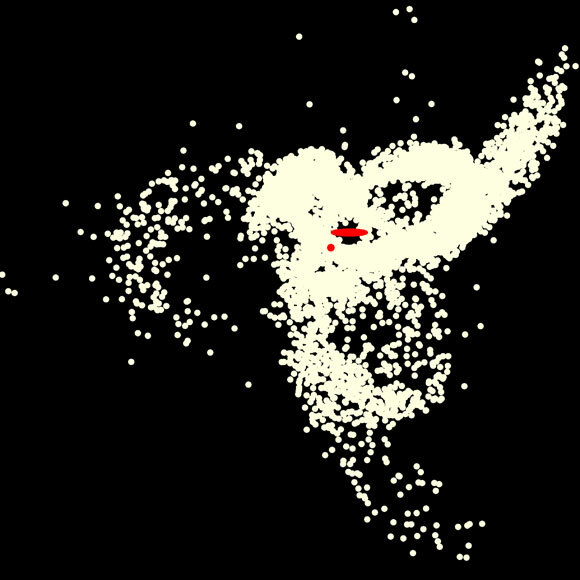 This movie simulates several passages of the Sagittarius dwarf galaxy past the galactic center (GC) of the Milky Way over the course of 8 billion years. The blue and red particles represent dark matter and stars, respectively. “The starting speed and approach angle have a big effect on the orbit, just like the speed and angle of a missile launch affects its trajectory,” explains Loeb. At the beginning of the simulation, the Sagittarius dwarf weighed about 10 billion times the mass of our Sun, or about one percent of the Milky Way’s mass. Dierickx’s calculations showed that over time, the hapless dwarf lost about a third of its stars and a full nine-tenths of its dark matter. This resulted in three distinct streams of stars that reach as far as one million light-years from the Milky Way’s center. They stretch all the way out to the edge of the Milky Way halo and display one of the largest structures observable on the sky. “More interlopers from Sagittarius are out there just waiting to be found,” says Dierickx. Be the first to comment on "Astronomers Reveal Farthest Stars in Milky Way Were Ripped from Another Galaxy"